Gopro Camera Accessories bundle and tripod mounts. Some unused. Mostly genuine. Condition is Used. Dispatched with Royal Mail 2nd Class. Includes gopro floating door mount, unopened genuine go pro tripod mounts, 2 suction mounts, gopro USB cable, gopro handlebar mount, spare door. DSLR Camera flash, 72mm polarizing filter and remote trigger. All used but working. Offers welcome. Genuine GOPRO CHEST MOUNT Accessories in excellent condition, very little used. New accessories are also included. 【Compatible with】 - GoPro Hero 5 4 3 3 2 1 Black Silver SJ4000/ SJ5000/ SJ6000, also for SJCAM SJ4000 5000 6000 7000 ,Xiaomi Yi, Apeman DBPOWER Lightdow WiMiUS Rollei IceFox ODRVM. 1 x Gopro Wrench. The selfie monopod allows you to shoot interesting angles including above peoples heads at gigs or sporting events or easily film yourself. The handy tripod adapter makes it easy to connect your GoPro to a variety of tripods, monopods, mounts and other accesories. 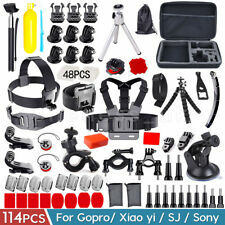 60 Pcs SJCAM Head Chest Accessories Kit for GoPro. New and high quality 60 pcs accessories set kit for GoPro hero. Compatible with: GoPro HD Hero 1/2/3/3 /4. A cool, special and practical design. This is for orders for the UK mainland excluding the Highlands, remote areas and all off-shore locations. Images are of the exact item. 60 Pcs SJCAM Head Chest Accessories Kit for GoPro. New and high quality 60 pcs accessories set kit for GoPro hero. Compatible with: GoPro HD Hero 1/2/3/3 /4. This is for orders for the UK mainland excluding the Highlands, remote areas and all off-shore locations. 1 SIDE GADGET POCKET. WELL PADDED FOR PROTECTION. BLACK WITH RED INTERIOR. SIZE 26W X 14D X 20H CM. 2 ZIPPED SIDE POCKETS. FILTERS INCLUDE NEUTRAL DENSITY X4, LIGHT TOBACCO GRAD, FOG 1, LIGHT RED GRAD, FOG 1. Weatherproof casing. Cycle Handlebar mount. 3 mount extension arms. Quick release base with sticky pads. UK STOCK! 100% Tested! 2 Year Warranty!